A packed house looked on at the Ocean City Intermediate School Thursday night for the annual Lip Sync and Talent Show. The event commemorated the school’s 50th anniversary, and the students and faculty members taking part in the festivities did so in fine fashion. The teachers kicked things off and had the auditorium rocking as they performed a medley of David Bowie tunes. “Space Oddity,” “Fashion,” “Under Pressure,” and “Let’s Dance” were a few of the songs performed in a tribute to the Thin White Duke. 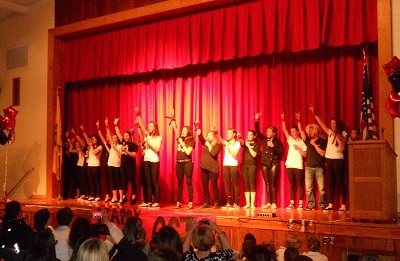 The teachers performed the finale of the nearly two-hour show, bringing the house down. Not to be outdone, Madison Majors and Lorelei Mullins kicked of the students’ portion with a rousing rendition of “Grown Woman” by Beyonce. “Dear Future Husband” by Meghan Trainor was performed by Keria Janto, Riley Madden, Sophia Tucker and Riley Robinson. That was followed by “Speak Life” and “Mac Daddy,” both by Toby Mac, performed by Natalie Argentino, and Caeli Barber and Lexi Hart, respectively, and featuring a special guest. “Gold” by Brit Nicole was performed by Natalie Argento and Sarah Gleason; “Count on Me” by Bruno Mars was lip synched by James and Jeremiah Craver and “I Know What You Did Last Summer” by Shawn Mendez was performed by Natalia Cesari, Sofia Keir, Ashley Sperduto-Meng and Katie Muller. “Bang My Head” by Sia was performed by the Intermediate School’s newest performing arts club, Mocean City. The group is comprised of 7th and 8th grade girls and is coached by members of the Advanced Dance Class of Ocean City High School. Members of the group included Sarah Burgos, Teagan DeMeglio, Gigi Gagliardi Varallo. “Faithfully” by Journey was performed by Julia Wilson and a “Donald Trump Remix” added some politically-themed humor to the proceedings thanks to Joni Dice, Katie Bowman, Chad Callahan, Luke Gallagher, Sydney Rossiter, Viva Mulhal, Sarah Burgos and a special guest. “Cuts That Spell” was performed by Gigi Gagliardi and the United States Pop of 2014” by DJ Earworm was interpreted by by Ashley Mathers, and Trinity Wojciechowski. The students’ finale act was “Who Runs the World” by Barden Bellas, performed by Ava Auwater, Marissa Guido, Laney Guido, Katie Mazzitelli, Brynn Bowman, Lauren Mirsky, Chole Mack and Cameryn Carr.